12 adventure surging episodes! This is the very first volume of the fantastic Jonathan Park series. We have listened to the adventures of Jonathan and his family. Each episode lasts approx 26 minutes and you can download a study guide online for each one. "Torrential flooding has driven Jonathan Park and his dad to seek shelter in a hidden cave. There they collide with the cave’s owners, the Brenan family, who are also escaping the storm. When the Parks and Brenans discover a massive dinosaur graveyard nearby, both families combine to build a creation science museum for the glory of the Creator. But the path to completion has some unexpected twists, with ruthless artifact dealers, mysterious encounters, and much more!" We love to listen to Jonathan Park when we travel. The entire family gets involved in the story and the mystery of what Jonathan and his family are trying to solve. Jonathan Park is celebrating 10 years of sharing creation with their listening audience. This series is focused on Creationism, rather than Evolution, and all of their discovering lead back to the Bible. It is a beautifully done series. The voices and drama keep you tuned in to hear what happens next. It is rare that we can just listen to 1 episode at a time! The kids always want 'just one more'. It is great for all ages, though I think ages 8 and older will understand it more clearly. 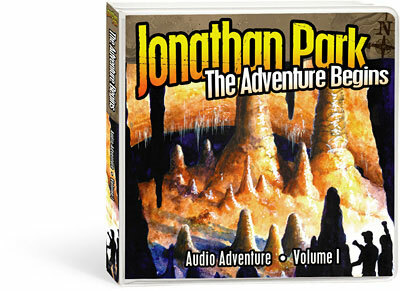 Visit the Jonathan Park website to learn more about these exciting adventures! You and the kids will enjoy this website where you can listen online, play games, learn about creation, and check out some real adventures! Follow the rafflecopter for easy entries! We do probably half of our shopping there throughout the year! One of my very favorite resources. Disclosure: The reviews and or opinions on this blog are my own opinions. I received the above to review. No monitory compensation was received. I was not required to write a positive review. Your experience may differ. The opinions I have expressed are my own I am disclosing this in accordance with the Federal Trade Commissions 16 CFR Part 255: Guides Concerning the Use of Endorsement and Testimonials in Advertising. I love that this is based on creation and not evolution! There's a place online to go behind the scenes and hear bloopers and extra information. I like that they have study guides for homeschool lessons. I learned it focuses on Creationism. I found out that there are adventure guides for the series. Thanks! Coffee & Tea Revue Blogger Sign Up! Lilla Rose Black Friday Sale!! Get Moving Blogger Event Hop Sign Up! Pictures On Gold. com Beautiful Locket Giveaway!